Anna Gram and Bonzai Bonner, aka LEZZER QUEST, have already made a name for themselves as the creator (Bonzai Bonner) and resident (Anna Gram) of the popular Shoot Your Shot and Weirdo Warehouse nights. This month, they launch their brand new queer party Doppelbänger at Sub Club, with the aim to invite their favourite LGBTQ+ DJs and allies to play for a diverse, up-for-it crowd. They want to create an atmosphere of positivity, acceptance and joy for everyone, as testament to the original spirit of underground dance music culture. 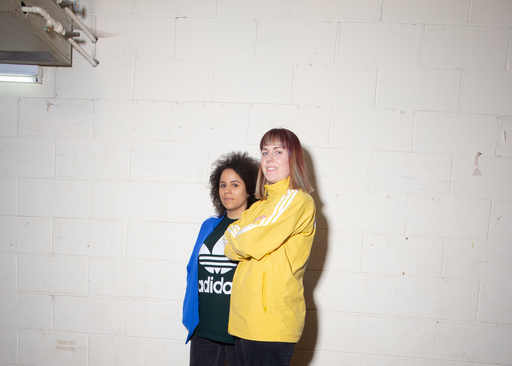 Playing at their first party are rising stars of techno Blasha & Allatt, co-founders of the hugely successful Manchester-based night Meat Free. Lezzer Quest: Firstly, we’re delighted to have you as the very first guests at Doppelbänger. How do you feel about making your Sub Club debut? Steffi Allatt: We are really happy that you chose us as your first guests! We're really excited to come back to Glasgow actually, it has a lovely feel about the place. We first played there last March for GYA (Grind Your Axe) at The Art School, which was wicked. We remember stumbling past Sub Club and being surprised at how small the entrance was! To be asked back to play there is very surreal. When did you start DJing as Blasha & Allatt? We started DJing together approximately seven years ago now. Tasha had moved from Scarborough three years previous, so once we connected it was about four or five months later that I made the move from the Midlands. How did the idea for Meat Free come about? Meat Free stemmed from a previous night that we ran called Fundamental, which fizzled out after a few events. Once that finished, there was a bunch of us that still wanted to carry on promoting in some form. Fast forward six years and Meat Free has taken on a life of its own. We've got a lot to be thankful for; lots of opportunities have come about off the back of it, let alone getting to play out a lot more. There seems to be a resurgence of nights with a more conscious aim at being diverse and inclusive, certainly that’s what we hope to achieve with Doppelbänger. Have you noticed an increase in these types of parties throughout the UK and further afield? If so, any recommendations? Yes, most definitely. When we first started Meat Free there definitely wasn't as much rhetoric around equality within the scene, but obviously as time goes on these issues get broken down and targeted, which makes for the better (or so at least you would hope). I can wholeheartedly recommend Love Muscle in Leeds and Kiss Me Again in Manchester. We've been fortunate enough to play at both of these and they are just hands down some of the best parties in the UK. We both DJ independently outside of LEZZER QUEST. Are you two strictly a duo or do you ever play solo? We've both played separately over the years, but to be honest it's been few and far between. We think at this point, while we are both enjoying DJing together, we're happy continuing as a duo. We both make music separately, so down the line it's likely that we could release music individually and that might push us in separate directions. We both bring a different vibe to our sets. Tasha is much more meticulous when it comes to mixing, her blends are always spot on, whereas I am a bit more blunt you could say. I like chopping and might not always get it right, but whatever, it works (for now!). You’re known for your techno sets, but are there other genres you enjoy playing in sets when you get the chance? Yes most definitely. Over the last few years we’ve played a lot of warm up sets, which willingly forced us to delve into various genres we might not have ever come across if we hadn’t had the chance. Lately I would definitely say we are more known for playing techno but we are really into that grime-y, broken UK/Bass sound, which is reflected in our recent mix for Pretty Pretty Good. Probably one of the most challenging sets for us of recent years was warming up for Boy Harsher. Personally, I’m a huge fan of theirs but didn’t necessarily have enough music I thought would work to set the scene before they came on. This turned out to be a really interesting and rewarding experience as we had a few people comment on our set afterwards, which was obviously really nice. Do you like to keep each other on your toes by throwing a musical curveball during a set every now and then? This used to happen a lot in the beginning, when we didn’t really gel together. There was an instance where we were playing at a house night and I played Blawan's Why They Hide Their Bodies Under My Garage, which obviously sent everyone a bit west. What advice would you give to budding DJ duos out there, particularly female ones? Be prepared to forgo those 36-hour-benders for a start! Preparation is key, particularly in a duo. One of the most important things is making sure you’re both on the same page before you start pulling records out for an upcoming gig. And, above all, practice, practice, practice. Not only are you looking to improve your individual skill set as a DJ, you're also responsible for making sure you both grow and develop your sound as a duo. Last year you played at Fabric for the first time and released your debut track Broughton 93. What exciting things does 2019 have in store for you? Yeah, last year was really a big year for us! This year we will be playing at Tresor, Fabric for the second time, Sub Club of course and a few parties/festivals we can’t mention for a little while longer. Production-wise we have a remix coming out on one of our favourite labels at some point this year. Lastly, LEZZER QUEST are known for posing hard-hitting questions on our Facebook page, so we wanted to ask you one. You HAVE to play one of these songs in every DJ set for the rest of your career: A) Tubthumping by Chumbawamba; B) Dancing in the Moonlight by Toploader. Which one’s it gonna be? Tubthumping all the way; it brings back nostalgia of being in primary school.